This week, we are SUPER excited to welcome author Andy Weir (The Martian), back to the show to chat with us about his new book, Artemis. Viewers who have seen Andy’s first appearance on our show on January 9, 2015, will remember just how awesome he is as a guest – and why we can’t wait to catch up with him this week. Andy began his career as a software engineer but wrote science fiction stories in his spare time. His novel, THE MARTIAN, was a blockbuster success which has allowed him to pursue his writing full-time. He is a lifelong space nerd and a devoted hobbyist of subjects such as relativistic physics, orbital mechanics, and the history of manned spaceflight. You can learn more about Andy and his books on his website (http://andyweirauthor.com)! The man in the moon, the pyramids on Mars. Every cloud, ever. Humans have a tendency to pattern match when they’re looking around the Universe – it’s called pareidolia. What causes this behavior, and how can we use this to debunk some hilarious conspiracy theories? John B. Charles, Ph.D., is the Chief Scientist of NASA’s Human Research Program (HRP), responsible for the scientific direction of human research and technology development enabling astronauts to go beyond low Earth orbit and eventually to Mars. The planetary lineup at dawn (minus the Moon) from September 12th. Image credit and copyright: Alan Dyer (AmazingSky.com). Following the Moon and wondering where are the fleeting inner solar system planets are this month? While Jupiter and Saturn sink into the dusk on the far side of the Sun this month, the real action transpires in the dawn sky in mid-September, with a complex set of early morning conjunctions, groupings and occultations. First, let’s set the stage for the planetary drama. Mercury just passed greatest elongation 18 degrees west of the Sun on September 12th. The action warms up with a great pre-show on the morning of Saturday, September 16th, when the closest conjunction of two naked eye planets for 2017 occurs, as Mercury passes just 3′ north of Mars. The conjunction occurs at 16:00 UT, favoring the western Pacific region in the dawn hours. The pair is just 17 degrees from the Sun. As mentioned previously, this is the closest conjunction of two naked eye planets in 2017, so close the two will seem to merge to the naked eye and make a nice split with binoculars. This is also one of the first good chances to spy Mars for this apparition, fresh off of its solar conjunction on July 27th, 2017. Mars is now headed towards a favorable opposition next summer on July 27th, 2018, one that’s very nearly as favorable as the historic grand opposition of 2003. Mars shines at magnitude +1.8 on Saturday morning with a disk 3.6” across, while Mercury shines at magnitude +0.05 with a 64% illuminated disk 6.4” across. Mars is actually 389 million km (2.6 AU) from the Earth this weekend, while Mercury is 158 million km (1.058 AU) distant. Follow that planet, as Mars also makes a close (12′) pass near Venus on October 5th. At the eyepiece, Venus will look like it has a large moon, just like the Earth! Think this pass is close? Stick around until August 10th, 2079 and you can actually see Mercury occult (pass in front of) Mars… our cyborg body should be ready to download our consciousness into by then. The waning crescent Moon joins the view on Monday, September 18th, making a spectacular series of passes worldwide as it threads its way through the stellar-planetary lineup. Occultations involving the waning Moon are never as spectacular as those involving the waxing Moon, as the bright limb of the Moon leads the way for ingress instead of the dark edge. The best sight to behold will be the sudden reappearance of the planet of star (egress) from behind the waning crescent Moon’s dark limb. First up is an occultation of Venus on September 18th centered on 00:55 UT. Unfortunately, this favors the eastern Indian Ocean at dawn, though viewers in Australia and New Zealand can watch the occultation under post dawn daytime skies. The pair is 22 degrees west of the Sun, and the Moon is two days from New during the event. Shining at magnitude -4, it’s actually pretty easy to pick out Venus near the crescent Moon in the daytime. Observers worldwide should give this a try on the 18th as well… folks are always amazed when I show them Venus in the daytime. The last time the Moon occulted Venus was September 3rd, 2016 and the two won’t cross paths again until February 16th, 2018. Next up, the Moon occults the +1.4 magnitude star Regulus on the 18th at 4:56 UT. Observers across north-central Africa are best placed to observe this event. This is the 11th occultation of Regulus by the Moon in a series of 19, spanning December 2016 to April 2018. The brightest star in the constellation Leo, Regulus is actually 79 light years distant. Next up, the dwindling waning crescent Moon meets the Red Planet Mars and occults it for the western Pacific at 19:42 UT. Shining at magnitude +1.8 low in the dawn sky, Mars is currently only 3.6” in size, a far cry from its magnificent apparition next summer when it will appear 24.3” in size… very nearly the largest it can appear from the Earth. And finally, the slim 2% illuminated Moon will occult the planet Mercury on September 18th centered on 23:21 UT. This week’s occultation favors southeast Asia at dawn, and the pair is only 16 degrees west of the Sun. Mercury is gibbous 74% illuminated and 6” in size during the difficult occultation. We just miss having a simultaneous “multiple occultation” this week. The Moon moves at the span of its half a degree size about once every hour with respect to the starry background, meaning an occultation must occur about 60 minutes apart for the Moon to cover two planets or a planet and a bright star at the same time, a rare once in a lifetime event indeed. The last time this transpired, the Moon covered Venus and Jupiter simultaneously for observers on Ascension Island on the morning of April 23rd 1998. When is the next time this will occur? We’re crunching the numbers as we speak… watch this space! Looking into next week, the Moon reaches New phase on Wednesday, September 20th at 5:31 UT/1:31 AM EDT, marking the start of lunation 1172. Can you spy the razor thin Moon Wednesday evening low to the west? Sighting opportunities improve on Thursday night. Don’t miss this weekend’s dance of the planets in the early dawn sky, a great reason to rise early. Read about conjunctions, occultations, tales of astronomy and more in our free guide to the Top 101 Astronomical Events for 2017 from Universe Today. 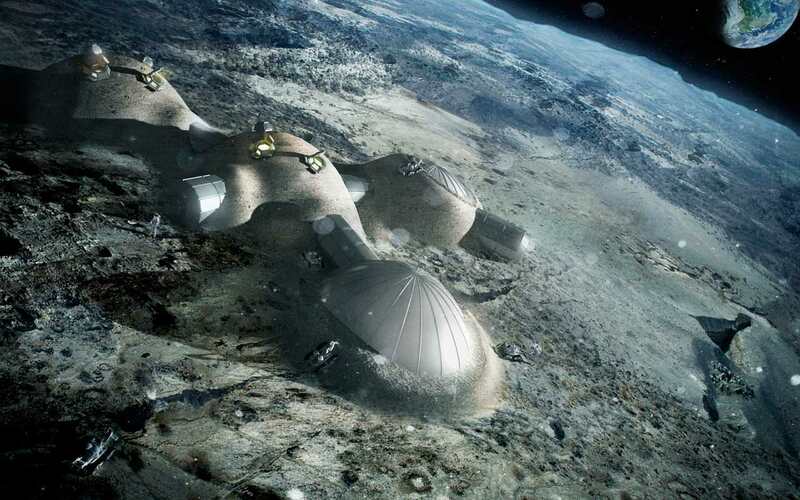 Human space exploration is going to kick into high gear in the coming decades. Within the inner Solar System alone, missions are being planned that will see robotic explorers and crews sent to Near Earth Objects (NEOs), back to the Moon, and even on to Mars. Beyond that, there are even plans to send robotic missions to Europa, Enceladus, Titan, and other “ocean worlds” to look for signs of life. In all cases, questions natural arise as to what kinds of missions will be most suited to them. In the case of places like Titan (which have low gravity and dense atmospheres) aerial drones are considered the best bet. But when it comes to rocky place like asteroids, the Moon and Mars, the best candidate may be robot snakes, which could find their way through tight spaces and travel underground. This concept was proposed three years ago by the Foundation for Scientific and Industrial Research (SINTEF), the largest independent research organization in Scandinavia. As part of a project commissioned by the ESA – known as SERPEX – they began studying how robots designed to mimic the movements of snakes could assist astronauts aboard the International Space Station. SINTEF researchers Pål Liljebäck and Aksel Transeth, and Knut Robert Fossum of NTNU’s CIRiS, playing with Wheeko the snake robot. Credit: SINTEF/Thor Nielsen. Compared to other robotic explorers, the main selling point of a robot snake is that it offers better mobility. For two decades now, NASA has been exploring the Red Planet with robotic rovers, starting with Pathfinder and Sojourner in 1997, Spirit and Opportunity in 2003, and then Curiosity in 2012. And in a little over two years, they will be sending the Mars 2020 rover. In all cases, these robots get around on six wheels and conduct experiments using instruments on robotic arms. But as the missions teams behind these rovers have learned, mobility can be a challenge. For instance, after five years on the Martian surface, the Spirit rover became stuck in soft soil, where its mission ended. And as successful as these missions have been at conducting research, there are locations that they simply can’t get to. The SINTEF researchers decided to tackle these issues through biomimicry – i.e. robots that mimic the functions of living creatures. By combining a rover that can navigate over large distances with a snake robot that can crawl along the ground and get into inaccessible places, they believe that future missions would be able to go places and collect samples in ways that other missions could not. In the configuration Transeth and his colleagues are envisioning, the rover would handle the task of traveling over long distances and then be able to dispatch the snake to crawl into tight inaccessible areas. They would be connected by a cable that would provide electricity, communication signals and would be used to pull the snake back in. In this sense, the snake would act like one of the rover’s arms, but would have the ability to travel autonomously. On Mars, sample collection is crucial to many space agency’s research. For the Curiosity rover, the presence of hydrated minerals and clays in soil samples confirmed that Mars once had a warmer, wetter climate. And in the future, scientists hope to find biomakers in Martian soil that could indicate the presence (past or present) of biological life. In this respect, a snake robot would prove very useful since it could access underground recesses the rover cannot. On the Moon, snake robots could be especially useful in helping the ESA establish it’s proposed “Moon Village” – a permanent base for scientific activity, tourism and mining that would also act as a successor to the ISS. The most likely location for this base could be within stable lava tubes or subterranean tunnels, which would provide natural shielding from meteors, solar radiation and cosmic rays. But before such construction of this base can take place, these tunnels and lava tubes will have to be inspected to ensure that they are safe for human habitation. The ESA has also been committed to studying comets in recent years, which included sending the Rosetta space probe and Philae lander to rendezvous with the comet 67P/Tsjurjumov–Gerasimenko in 2014. Unfortunately, the lander experienced problems when its system of harpoons (designed to hold it in place) failed to deploy. As a result, it was forced to make another soft landing which left it in a position and location that was not optimal for research. In the future, the ESA could get avoid this by sending a probe to the surface that would deploy the snakes to the surface, which could then burrow into the comet’s interior. But in the meantime, operations aboard the ISS remain the most realistic and likely application for these robots. Here, astronauts are engaged in ongoing scientific experiments, but are also responsible for maintaining the station and all of its equipment. In this latter respect, the SERPEX project could certainly prove useful, providing them with robot helpers that could help with the regular maintenance. Some of the concepts developed by SINTEF so far include the Aiko robot, which was developed to produce a portable system for experimenting with snake robot locomotion. The robot consists of several identical joint modules with two motorized degrees of freedom each. As you can see from the video above, it is propelled by contact forces between the robot and the obstacles in its way. And then there’s the Wheeko robot, which was developed by SINTEF in conjunction with the Center for Interdisciplinary Research in Space (CIRiS), and the Norwegian Space Center (NSC). Much like Aiko, this experimental robot was designed to study snake robot locomotion across flat surfaces. It consists of ten identical joint modules with two motorized degrees of freedom each. But of course, developing snake robots that can handle various tasks while working in different environments – ranging from working in micro-gravity aboard the ISS to snaking their way through tunnels on a body with gravity – presents many challenges. And in the coming years, Transeth and his colleagues will be looking for ways to address all of them. Already, astronauts aboard the ISS have robotic helpers in the form of the Synchronized Position Hold Engage and Reorient Experimental Satellite (SPHERES). These free flying satellites serve as test beds for a diverse range of hardware and software, all of which is critical for future space missions that use distributed spacecraft architecture. Soon enough, they will be replaced by a drone called Astrobee – a robotic cube packed with sensors, cameras, computers, and a propulsion system. The brainchild of the Ames Research Center’s Intelligent Robotics Group, this drone will be flying around the ISS and making inspections. Some of the technology used by Astrobee will be similar to what Transeth and his colleague are hoping to apply to their snake robot system. As such, they hope to learn much from this drone’s time aboard the ISS and incorporate the lessons that are learned from it. In February of 2015, the National Observatory of Athens and the European Space Agency launched the Near-Earth object Lunar Impacts and Optical TrAnsients (NELIOTA) project. Using the 1.2 meter telescope at the Kryoneri Observatory, the purpose of this project is to the determine the frequency and distribution of Near-Earth Objects (NEOs) by monitoring how often they impact the Moon. Projects like NELIOTA are important because the Earth and the Moon are constantly being bombarded by natural space debris – which ranges in size from dust and pebbles to larger objects. While larger objects are rare, they can cause considerable damage, like the 20-meter object that disintegrated above the Russian city of Chelyabinsk in February of 2013, causing extensive injuries and destruction of property. What’s more, whereas particulate matter rains down on Earth and the Moon quite regularly, the frequency of pebble-sized or meter-sized objects is not well known. These objects remain too small to be detected by telescopes directly, and cameras are rarely able to picture them before they break up in Earth’s atmosphere. Hence, scientists have been looking for other ways to determine just how frequent these potentially-threatening objects are. One way is to observe the areas of the lunar surface that are not illuminated by the Sun, where the impact of a small object at high speed will cause a bright flash. These flashes are created by the object burning up on impact, and are bright enough to be seen from Earth. Assuming the objects have a density and velocity common to NEOs, the brightness of the impact can be used to determine the size and mass of the object. After being taken offline in 2016 for the sake of making upgrades, the NELIOTA project officially began conducting operations on March 8th, 2017. Using this refurbished telescope, which is operated by the National Observatory of Athens, NELIOTA is capable of detecting flashes that are much fainter than any current, small-aperture, lunar monitoring telescopes. The telescope does this by observing the Moon’s night hemisphere whenever it is above the horizon and between phases. At these times – i.e. between a New Moon and the First Quarter, or between the Last Quarter and a New Moon – the surface is mostly dark and flashes are most visible. Incoming light is then split into two colors and the data is recorded by two advanced digital cameras that operate in different color ranges. “Its large telescope aperture enables NELIOTA to detect fainter flashes than other lunar monitoring surveys and provides precise color information not currently available from other project. Our twin camera system allows us to confirm lunar impact events with a single telescope, something that has not been done before. Once data have been collected over the 22-month long operational period, we will be able to better constrain the number of NEOs (near-Earth objects) in the decimetre to metre size range. The NELIOTA project scientists are currently collaborating with the Science Support Office of ESA to analyze the flashes and measure the temperatures of each flash. From this, they hope to be able to make accurate estimates of the mass and size of each impactor, which they will further corroborate by analyzing the size of the craters these impacts leave behind. The study of impacts on the Moon will ultimately let scientists know exactly how often larger objects are raining down on Earth. Armed with this information, we will be able to make better predictions on when and how a potentially-threatening object could be entering our atmosphere. 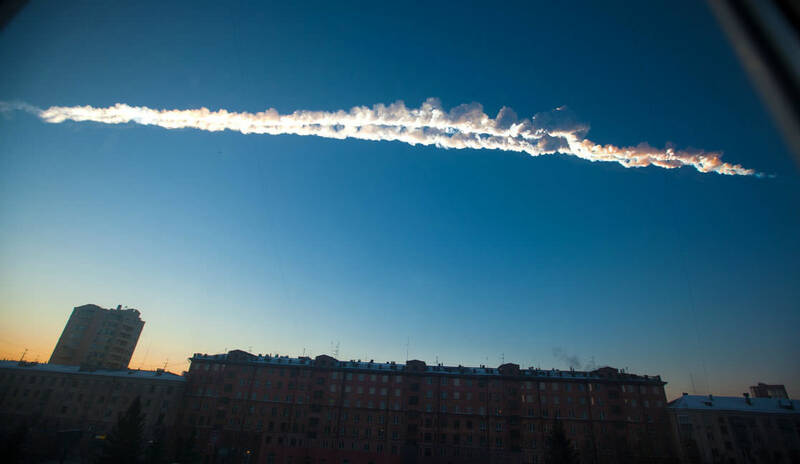 As the Chelyabinsk meteor demonstrated, one of the greatest dangers posed by meteorites is a general lack of preparedness. Where people can be forewarned, injury, damage and even deaths can be prevented. NELIOTA is also contributing to public outreach and education through a number of initiatives. 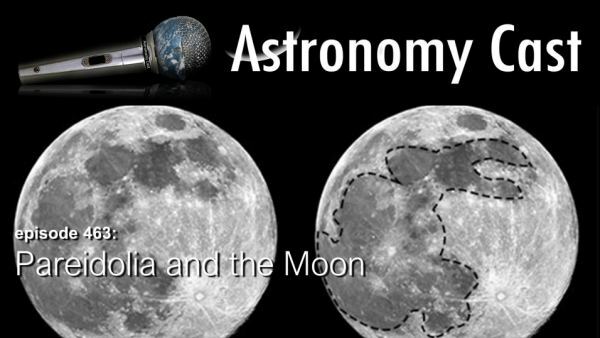 These include public tours of the Kryoneri Observatory – in which the details of the NELIOTA project are shared – as well as presentations to students and the general public about Near-Earth Asteroids. The project team are also training two PhD students in how to operate the Kryoneri telescope and conduct lunar observing, thus creating the next-generation of NEO observers. This summer (Friday, June 30th), the Observatory will also be hosting a public event to coincide with Asteroid Day 2017. This international event will feature presentations, speeches and educational seminars hosted by astronomical institutions and organizations from all around the world. Save the date! There’s a new type of planet in town, though you won’t find it in well-aged solar systems like our own. It’s more of a stage of formation that planets like Earth can go through. And its existence helps explain the relationship between Earth and our Moon. The new type of planet is a huge, spinning, donut-shaped mass of hot, vaporized rock, formed as planet-sized objects smash into each other. The pair of scientists behind the study explaining this new planet type have named it a ‘synestia.’ Simon Lock, a graduate student at Harvard University, and Sarah Stewart, a professor in the Department of Earth and Planetary Sciences at the University of California, Davis, say that Earth was at one time a synestia. The current theory of planetary formation goes like this: When a star forms, the left-over material is in motion around the star. This left-over material is called a protoplanetary disk. The material coagulates into larger bodies as the smaller ones collide and join together. As the bodies get larger and larger, the force of their collisions becomes greater and greater, and when two large bodies collided, their rocky material melts. Then, the newly created body cools, and becomes spherical. It’s understood that this is how Earth and the other rocky planets in our Solar System formed. Lock and Stewart looked at this process and asked what would happen if the resulting body was spinning quickly. When a body is spinning, the law of conservation of angular momentum comes into play. That law says that a spinning body will spin until an external torque slows it down. The often-used example from figure skating helps explain this. If you’ve ever watched figure skaters, and who hasn’t, their actions are very instructive. When a single skater is spinning rapidly, she stretches out her arms to slow the rate of spin. When she folds her arms back into her body, she speeds up again. Her angular momentum is conserved. This short video shows figure skaters and physics in action. If you don’t like figure skating, this one uses the Earth to explain angular momentum. Now take the example from a pair of figure skaters. When they’re both turning, and the two of them join together by holding each other’s hands and arms, their angular momentum is added together and conserved. Replace two figure skaters with two planets, and this is what the two scientists behind the study wanted to model. What would happen if two large bodies with high energy and high angular momentum collided with each other? If the two bodies had high enough temperatures and high enough angular momentum, a new type of planetary structure would form: the synestia. “We looked at the statistics of giant impacts, and we found that they can form a completely new structure,” Stewart said. “We looked at the statistics of giant impacts, and we found that they can form a completely new structure.” – Professor Sarah Stewart, Department of Earth and Planetary Sciences at the University of California, Davis. As explained in a press release from the UC Davis, for a synestia to form, some of the vaporized material from the collision must go into orbit. When a sphere is solid, every point on it is rotating at the same rate, if not the same speed. But when some of the material is vaporized, its volume expands. If it expands enough, and if its moving fast enough, it leaves orbit and forms a huge disc-shaped synestia. Other theories have proposed that two large enough bodies could form an orbiting molten mass after colliding. But if the two bodies had high enough energy and temperature to vaporize some of the rock, the resulting synestia would occupy a much larger space. “The main issue with looking for synestias around other stars is that they don’t last a long time. These are transient, evolving objects that are made during planet formation.” – Professor Sarah Stewart, UC Davis. These synestias likely wouldn’t last very long. They would cool quickly and condense back into rocky bodies. For a body the size of Earth, the synestia might only last one hundred years. The synestia structure sheds some light on how moons are formed. The Earth and the Moon are very similar in terms of composition, so it’s likely they formed as a result of a collision. 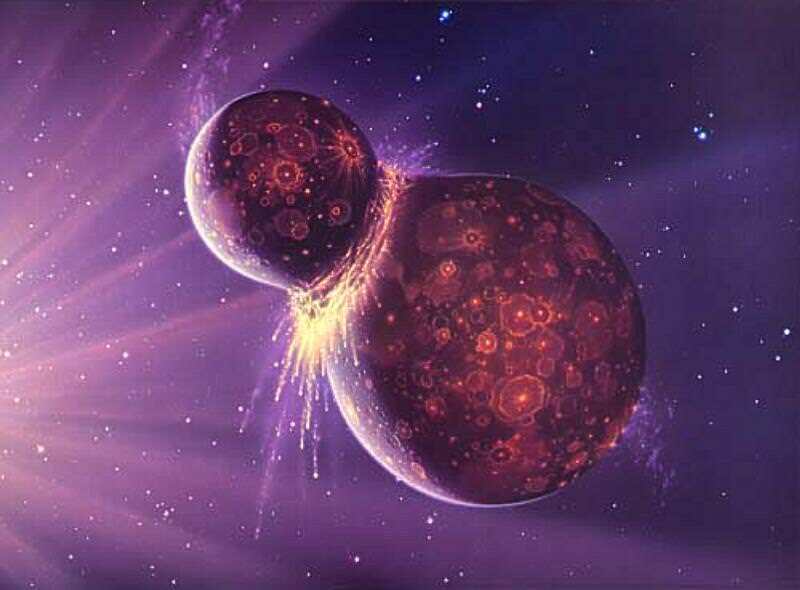 It’s possible that the Earth and Moon formed from the same synestia. These synestias have been modelled, but they haven’t been observed. However, the James Webb Space Telescope will have the power to peer into protoplanetary disks and watch planets forming. Will it observe a synestia? Besides Earth, Saturn may be the only other planet where you can order rings with a side of ravioli. 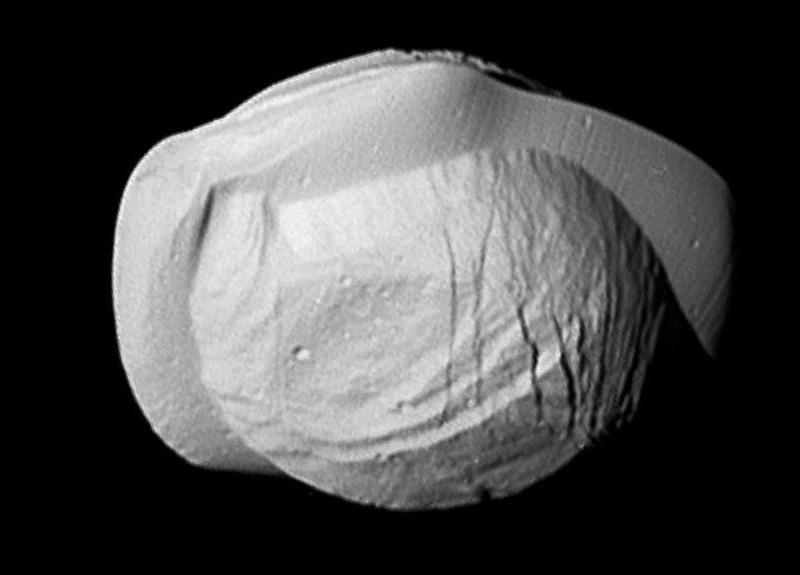 Closeup photos taken by the Cassini probe of the the planet’s second-innermost moon, Pan, on March 7 reveal remarkable new details that have us grasping at food analogies in a feeble attempt to describe its unique appearance. The two-part structure of the moon is immediately obvious: a core body with a thin, wavy ridge encircling its equator. How does such a bizarre object form in the first place? There’s good reason to believe that Pan was once part of a larger satellite that broke up near Saturn long ago. Much of the material flattened out to form Saturn’s rings while large shards like Pan and another ravioli lookalike, Atlas, orbited within or near the rings, sweeping up ring particles about their middles. Tellingly, the ridges are about as thick as the vertical distances each satellite travels in its orbit about the planet. Today, Pan orbits within and clears the narrow Encke Gap in Saturn’s outer A-ring of debris. It also helps create and shape the narrow ringlets that appear in the gap It’s lookalike cousin Atlas orbits just outside the A-ring. Moons embedded in rings can have profound effects on that material from clearing gaps to creating new temporary ringlets and raising vertical waves of material that rise above and below the ring plane. All these effects are produced by gravity, which gives even small objects like Pan dominion over surprisingly vast regions. PORT CANAVERAL – Bit by bit, piece by piece, the first of NASA’s SLS megarockets designed to propel American astronauts on deep space missions back to the Moon and beyond to Mars is at last coming together on the Florida Space Coast. And the first big integrated piece of actual flight hardware – the powerful second stage named the Interim Cryogenic Propulsion Stage (ICPS) – has just arrived by way of barge today (Mar. 7) at Port Canaveral, Fl. The ICPS will propel NASA’s new Orion crew capsule on its maiden uncrewed mission around the Moon – currently slated for blastoff on the inaugural SLS monster rocket on the Exploration Mission-1 (EM-1) mission late next year. SLS-1/Orion EM-1 will launch from pad 39B at NASA’s Kennedy Space Center in late 2018. The SLS will be the most powerful rocket in world history. NASA is currently evaluating whether to add a crew of 2 astronauts to the SLS-1 launch which would result in postponing the inaugural liftoff into 2019 – as I reported here. The SLS upper stage – designed and built by United Launch Alliance (ULA) and Boeing – arrived safely by way of the specially-designed ship called the Delta Mariner early Tuesday morning, Mar. 7, into the channel of Port Canaveral, Florida – as witnessed by this author. “We are proud to be working with The Boeing Company and NASA to further deep space exploration!” ULA said in a statement. Major assembly of the ICPS was completed at ULA’s Decatur, Alabama, manufacturing facility in December 2016. The ICPS is the designated upper stage for the first maiden launch of the initial Block 1 version of the SLS. It is based on ULA’s Delta Cryogenic Second Stage which has successfully flown numerous times on the firm’s Delta IV family of rockets. In the event that NASA decides to add a two person crew to the EM-1 mission, Bill Hill, NASA’s deputy associate administrator for Exploration Systems Development in Washington, D.C., stated that the agency would maintain the Interim Cryogenic Propulsion stage for the first flight, and not switch to the more advanced and powerful Exploration Upper Stage (EUS) planned for first use on the EM-2 mission. The ICPS was loaded onto the Delta Mariner and departed Decatur last week to began its sea going voyage of more than 2,100 miles (3300 km). The barge trip normally takes 8 to 10 days. “ULA has completed production on the interim cryogenic propulsion stage (ICPS) flight hardware for NASA’s Space Launch System and it’s on the way to Cape Canaveral aboard the Mariner,” ULA noted in a statement last week. The 312-foot-long (95-meter-long) ULA ship docked Tuesday morning at the wharf at Port Canaveral to prepare for off loading from the roll-on, roll-off vessel. The Delta Mariner can travel on both rivers and open seas and navigate in waters as shallow as nine feet. “ICPS, the first integrated SLS hardware to arrive at the Cape, will provide in-space propulsion for the SLS rocket on its Exploration Mission-1 (EM-1) mission,” according to ULA. The next step for the upper stage is ground transport to United Launch Alliance’s Delta IV Operation Center on Cape Canaveral Air Force Station in Florida for further testing and processing before being moved to the Kennedy Space Center. ULA will deliver the ICPS to NASA in mid-2017. “It will be the first integrated piece of SLS hardware to arrive at the Cape and undergo final processing and testing before being moved to Ground Systems Development Operations at NASA’s Kennedy Space Center,” said NASA officials. The upper stage is powered by a single RL-10B-2 engine fueled by liquid hydrogen and oxygen and generates 24,750 pounds of thrust. It measures 44 ft 11 in (13.7 m ) in length and 16 ft 5 in (5 m) in width. All major elements of the SLS will be assembled for flight inside the high bay of NASA’s iconic Vehicle Assembly Building which is undergoing a major overhaul to accommodate the SLS. The VAB high bay was extensively refurbished to convert it from Space Shuttle to SLS assembly and launch operations. For SLS-1 the mammoth booster will launch in its initial 70-metric-ton (77-ton) Block 1 configuration with a liftoff thrust of 8.4 million pounds – more powerful than NASA’s Saturn V moon landing rocket. 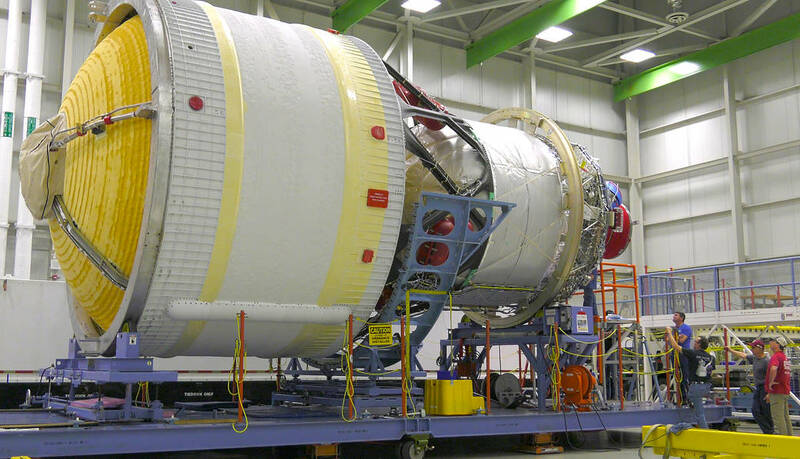 Components of the SLS-1 rocket are being manufactured at NASA’s Michoud Assembly Facility and elsewhere around the country by numerous suppliers. Michoud is building the huge liquid oxygen/liquid hydrogen SLS core stage fuel tank, derived from the Space Shuttle External Tank (ET) – as I detailed here. The ICPS sits on top of the SLS core stage. The next Delta IV rocket launching with a Delta Cryogenic Second Stage is tentatively slated for March 14 from pad 37 at the Cape. The Orion EM-1 capsule is currently being manufactured at the Neil Armstrong Operations and Checkout Building at the Kennedy Space Center by prime contractor Lockheed Martin.